When I was pregnant with my 2nd child I had the hardest time sleeping. I could never get comfortable. I remember there was times that I would have maybe two hours of sleep and then I will be up all night and I still had to get myself into work. I'm always looking for a new pillow. I have a collection of pillows on my bed since I like to surround myself with pillows. If you are looking for a gift idea for a new parent, I would suggest a The Floating Comfort Pillow by Mediflow. Who does not like sleep? As a new parent you won't get much of it especially once the baby arrives. When you are able to find time to sleep, you will want to sleep in something that is comfortable. Something like a good pillow. The Floating Comfort Pillow by Mediflow reminds me of so much like a water bed that were popular in the 90s. You will need to put the water into the pillow yourself. Without the water, the pillow is soft, way too soft to support your neck. The water helps build the firmness of your pillow. You will receive a spout to open and close the valve to pour the warm water into the pillow. I am very clumsy so I am spilling the water all over the place and the water slid off the pillow so it is slightly damp. You should start by adding 2-3 litres of water and adjust accordingly how firm you like your pillow. Once you are done make sure you remove the air out of the pillow by pressing down the pillow. It is the most important task and the hardest to do. I have no idea if I got it all out of the pillow. Then seal it and put the spout in a safe place so you don't loose it since you will need it again to change the water once a year. The pillow is comfy and I like how you can adjust the firmness of the pillow whenever you want without purchasing a new pillow. The valve is well made since I don't see any signs of leaking water. The water adjust very easily to support my head whenever I move my head. I can't sleep without hugging a pillow and The Floating Comfort Pillow became my hugging pillow. It would be great if it comes as a body pillow. I could also see myself using it all the time. Other than offering yourself as a middle-of-the-night babysitter, there’s only one item that friends and family can give a new mom this holiday season to help keep her from feeling like a zombie. It begins with “the gift of a great night’s sleep” on The Floating Comfort Pillow by Mediflow, the only pillow clinically proven to improve the quality of sleep. Life with a newborn doesn’t allow for much pillow time, so the few hours a mom can rest her head should be maximized. 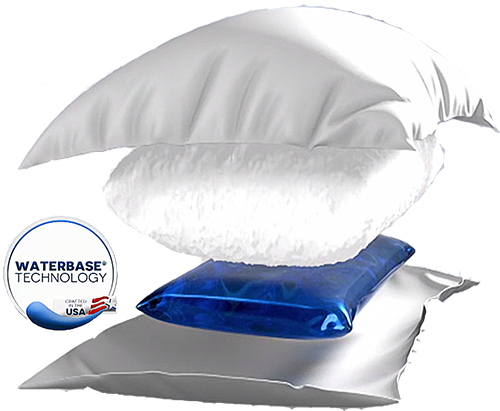 The Floating Comfort Pillow features an exclusive waterbase technology that provides responsive support by adapting to the shape of your head and neck as you move during sleep. No matter which way you lay, your head and neck remain in proper alignment, creating a totally different kind of sleeping experience. This is especially life changing for baby-wearing moms whose bodies always ache! Reached #1 Bestseller in Amazon Home & Kitchen during July 2017 among 24,163,959 items Better nights of sleep lead to better functioning days for new moms – and that’s something to benefit the whole family. This holiday season, show her how much you care about her well-being with the Floating Comfort Pillow by Mediflow. The MSRP is only $49.99, but the benefits are priceless. For more information, visit www.mediflow.com. inventor of the water pillow and Mediflow founder, Maurice Bard, a local French Canadian. I would like to offer one of my readers to win a The Floating Comfort Pillow by Mediflow. This giveaway will run from November 1st to November 29th, 2017 (midnight EST). Winner, You have 24 hours to reply. You must be 18+ Canadians & US Only. Good Luck! Psst - Can't win if you don't answer the mandatory question. I am not responsible for shipping and handling or damages of the prize. The prize is shipped by the Sponsor and they may substitute the prize depending what is in stock. Your information will be sent to the Sponsor for the purpose of shipping out the prize. I'm from Ontario. 38 STQ. I'd totally keep this for myself if I win. will keep this for myself. Am in BC. Would love this pillow for me! Answer is 38. I'm in MB and this would be a great gift for my mom. Thanks! Answer is 38. I'm from BC and would keep this pillow for myself. My answer to the question is 38. 38. Ontario. I would give it to a family who needs a new pillow and deserves a really nice one. I'm from Ontario. I would keep this pillow. 38 is the answer. Hi! I'm in Manitoba and the answer to the question is 38. I would gift this pillow to my sister for Christmas if I win, thanks! I am from Ontario. This pillow will be kept as I need a new one. The answer to the skill testing question is thirty eight. I'm in BC and would definitely give this to my daughter who has a very bad neck! Manitoba. I would keep this pillow for myself. The answer is 38. I'm in AB and the answer is 38. I would try to keep this for myself but I may have to wrestle my husband for it. He's always stealing my pillows saying that I give him the lumpy ones. I am from NL. The answer is 38. I would give it to my mom if I won. Ontario, I would keep it for myself, and 38. I'm in Ontario. Answer:38. I'd keep this for myself. I am from Newfoundland. I'd keep it for myself. The answer is 38. I am from AB and I would keep it for myself. I actually need a new pillow. I'm from Ontario. I would keep it for myself. And the answer to the skill testing question is 38. I would probably keep this for myself. I am in need of a new pillow! The answer to the math question is 38. I am Canadian and from New Brunswick. The answer is 38. Thanks for the awesome giveaway opportunity. Hi, I'm from Ontario, I would keep for myself as long as my husband doesn't try to take it (we both have neck and back issues so finding a perfect pillow is very important for a great nights sleep), the answer is 38. I am in Manitoba and the answer is 38. I am in Ontario, I would give it to my soon to be hubby as he has trouble sleeping throughout the night (he has neck and back issues and hopefully this is the perfect one). The answer is 38, good luck to everyone. Quebec resident. I would most likely give it to my wife, she would be able to get a better night's sleep. Anwser to the math question is 38. From AB, answer is 38, would keep and try it! I'm from Ontario and the answer to the STQ is 38. I've tried so many bad pillows and would keep this for myself. Thanks for the chance. I'm from Quebec and will keep the pillow for myself. Answer is 38. I will be keeping it as the weather drops in snowy Alberta. I'm from Manitoba. The answer is 38. And I would definitely keep this for myself. I am in Ontario. I would keep this for myself. My answer is 38. US - PA. I would give to my husband. Thanks! Ontario! Answer is 38. I would love to win this for myself. i am tired of spending $100's of dollars on pillows that within a few months need to be replaced. I am from Delaware, would keep this for myself. I am from Nova Scotia and I would keep it for myself. I'm from the US and would keep this for myself. I would definitely use this for myself. I'm from Ontario, and it's 38. Thank you! I AM FROM NY STATE, AND I WILL DEFINATELY BE KEEPING THIS AMAZING PILLOW FOR MYSELF! 38 I am from BC. Would love a new pillow, it's been a few years since I've replaced mine. I'm from Delaware. I would keep the pillow for myself. I am Lynnie, from Ontario, and I would keep this for myself. STQ is 38! I would give this to my mom! I am from Minnesota. I'm from Ontario and would keep this pillow for myself. My answer to the question is 38. I am a mom of four from New Hampshire. A good pillow is hard to find, I'm still trying! This one looks great! I am in Alberta. The answer to the STQ is 38 I would give this to my hubby if I won. He does not sleep well so this might help him. I'm in BC, my answer to the STQ is 38. And I'd love to keep this pillow -it would be such a treat! I would keep this pillow for myself. The answer to the question is 38. Wisconsin. I would keep it. I'm in Ontario & I'd keep it for myself, the answer is 38. I'm from Wisconsin. I would keep this pillow for myself. I am from Alberta. The answer is 38. I would love this for myself. I'm a US citizen keeping this for myself. I would keep this for myself if I won. Living in Ontario. Answer is 38. I would keep this for myself. I live in Ontario and the answer is 38. I am in BC. I would give this to my husband. The answer is 38. I am from ONtario and I would definitely have to gift this awesome pillow to my wonderful husband! The STQ answer is 38! I'd keep the pillow for myself. The answer is 38. I'm from Ontario. I would love to gift this to my mom. I am in ON - answer 38 ! I would gift this to my hubby , he would love it after a hard days work , get a good nights sleep ! From Ontario. My hubby would love this pillow. Answer is 38. I'm from Wisconsin, and I would probably keep it for myself if I won. I am from MB and will give this to my son. The answer is 38. I am from Ontario. The answer is 38. I would keep this pillow for myself! I am from AB. Answer is 38. I would keep it for myself. I am from Nova Scotia. I would keep it for myself. The answer is 38. BC and answer is 38! i would keep the pillow for myself! I'm from Ontario and I would keep the pillow for myself. My answer is: 38. I'm in Ontario. STQ - 38. I would keep the pillow for me.